PCL is the digital printed document created in the Printer Command Language (PCL) page description language. The format describes the layout of text and graphics for the document. In essence, PCL was originally used by Hewlett-Packard printers in the 1980s and now used by HP LaserJet printers and others. To convert excel to pcl or xls to pcl, you can take docPrint as the application tool. As one application of docPrint Document Converter Professional which also called as docPrint Pro, docPrint is a Window printer also a document converter. docPrint is a Windows printer driver that saves ink, paper and time by controlling printed output. It supports to print 2, 4, 6, 8 or 16 pages on a single sheet of paper, also supports to scale A0, A1, A2, A3 papers to standard Letter or A4 paper sizes. docPrint is also a document converter which can convert any printable document to 50+ graphics, it may be a Microsoft Word file, Adobe PDF file, HTML file, Excel file and others. docPrint supports various image formats, resolutions and compressions. docPrint is easy-to-use, just print a document to docPrint, you will be able to start using document printer software. But you should download docPrint Pro at http://www.verypdf.com/artprint/docprint_pro_setup.exe and install it on your computer for using docPrint. Please see the steps about converting excel to pcl below. Please run the printer driver first. If docPrint is the default printer on the computer, you just need to right click the Excel document and choose “Print” option to run docPrint directly. On the contrary, you should click “File”—“Print” to open “Print” dialog box in the open Excel document and choose “docPrint” as current printer in “Printer” combo box. Then please click “Print” button. You can also have the aid of the hot key “Ctrl”+ “P”. Then open “Save As” dialog box. Use the “Save File” button which looks like the floppy disk in the toolbar. Press “Ctrl”+ “S” to open “Save As” dialog box. With anyone of the ways above, you can open “Save As” dialog box at any time. 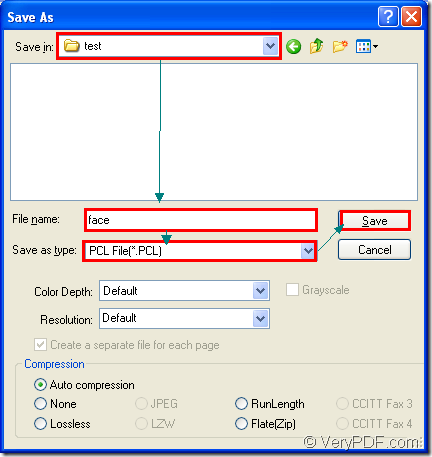 The last step is to save the target files in “Save As” dialog box. You should do the following operations. Please specify the location for the target files in “Save in” combo box. Edit the name of the target files in “File name” edit box. 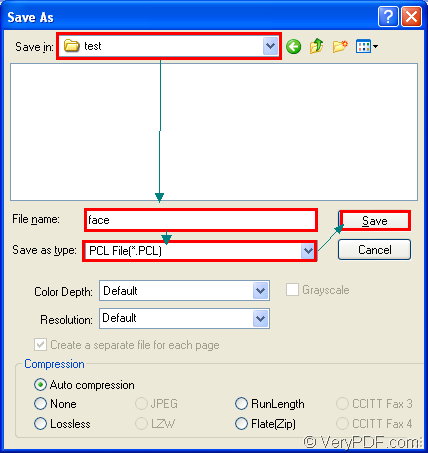 Choose the output format as “PCL File (*.PCL)” in “Save as type” combo box. Please see the “Save As” dialog box in Figure1. You are able to browse the target files in specified location when the conversion from excel to pcl is over. You can read more related articles about docPrint Pro at the blog VeryPDF Knowledge Base. How to convert MS Office Excel documents of XLS to PCL? How to convert documents of MS Office to ps? This entry was posted in docPrint Pro and tagged excel to pcl, xls to pcl. Bookmark the permalink.